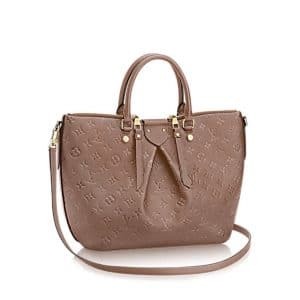 The Louis Vuitton Speedy Bandouliere 30 is an iconic handbag that has become a symbol of style all over the world. Its unique shape, spectacular handles and versatile strap for casual cross-body wear are the elements that recommend it for fashionable days in the city or chic getaways. Initially designed for ‘30s travelers, this lightweight, supple and forever in style purse crafted from embossed Empreinte leather is a brilliant choice for modern women who adore subtle elegance. As it usually happens with beautiful designer handbags, many replica manufacturers try to clone the original design. The thing is that, getting these exquisite purses right is not that easy. 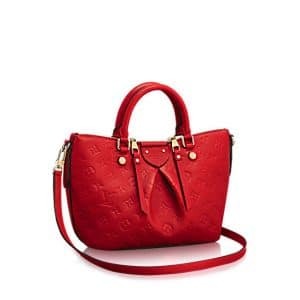 The materials used for making a Louis Vuitton bag are some of the most expensive and high quality ones available, the core design is effortlessly sophisticated and the authenticity markings are very distinctive and intricately created. There is nothing easy or common about these products so when you are buying a Speedy Bandouliere 30 online or from a store that isn’t authorized you should really pay great care to the details that make the difference between a fake and the genuine item. Below you will find a very comprehensive and thorough comparison that can serve as a very useful guide for identifying an original LV. 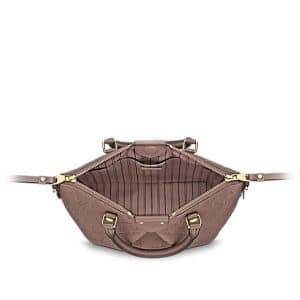 The LV Speedy Bandouliere 30 comes only in the following size: 11.8 x 8.3 x 6.7 inches. Its shape is very particular. This city bag enjoys the characteristics of the classic travelling bag. It is spacious, easy to carry around and versatile. The body has a rectangular shape with rounded corners and the sides are arched as to accommodate as many personal belongings as possible. The unique feature of the purse is that it is manufactured from smooth and supple Empreinte leather. This is not some ordinary leather, but a high quality fabric that feels very light and durable. Due to this choice of material, the Bandouliere doesn’t have a rigid and firm stature. The elegant and high quality fabric bends when the bag is empty, as you can also see in the pictures. Because fake factories do not have access to this superior leather, a replica will most likely have a more defined and sculptured shape (again, this can be easily noticed in the photos). This knockoff doesn’t make any visible creases even if it is completely empty. It will stand tall by its own. Also the surface of the leather has more prominent grains and a colder shine. These are not the only differences that you can easily notice when comparing the replica with the original LV. The embossed LV logo and flowery motifs are also off. On the real purse, the symbols are in a bigger size and aren’t as deeply and clearly embossed into the material. By making the LV pattern so obvious the final effect is the one of a poorly imitated product. You should really stay away from such a clone as it screams “fake” from miles away. The handles of the Bandouliere shouldn’t be ignored. These have a very distinctive look. The brand has made them seamlessly round. Their proportions are perfect and their widths on the end parts that connect to the golden brass lugs are straight and identical. The replica has taller arched handles and their ends are narrower and make small creases as to fit on the smaller lugs. The mistakes continue with the key holder piece that should have an arrow-like shape and the pull piece of the zipper has many long and large leather strips that make it easier to grab it. The fake bag doesn’t have them. On its zipper pull piece there are only two short leather tabs. The Louis Vuitton Speedy Bandouliere 30 comes with shiny golden brass pieces and every single one of them carries the company’s name or logo. If you compare the knockoff with the genuine purse you will find a few differences on these parts as well. 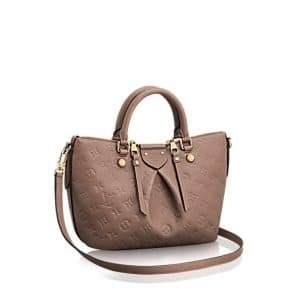 For instance, the two rounded gold pieces below the point where the handles attach to the body are more spaced apart on the fake bag and the “LOUIS VUITTON” name embossed on them is slightly off. The distance between the letters is uneven and the interior of the characters looks like it was smudged. The small lock charm has also a flaw. It is printed with “LOUIS VUITTON PARIS Made in France”, but the “F” is incomplete. It is missing the two upper lines so it looks like an “I”. Also, the placement of the lock is way off. This part should be attached to the side ring that connects to the removable strap whereas the replica has it attached on the zipper’s pull piece. The Bandouliere 30 comes with a very elegant and durable black textile lining. Any deviation from this color and type of fabric is a huge mistake. Unfortunately, the knockoff uses a bright blue textile lining that looks very cheap in contrast with the outside black leather. Fabulous and sophisticated, the LV Speedy Bandouliere 30 is a modern and chic city bag that is perfect for about any type of occasion. From casual shopping and business meetings to public events and stylish traveling, this purse is the ideal companion for all your glamorous looks. Small does matter – you can store less stuff, it’s and feels lighter on your shoulder, the compartments are not the same (most of the times) and more importantly, the appearance is completely different. 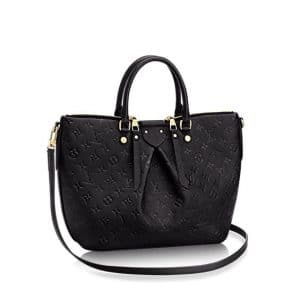 I am glad it is here, introducing the Louis Vuitton Monogram Empreinte Saint Germain BB Bag. The name is as timeless as the bag itself. This is a new bag released not long ago, but the fashion house has only sold PM and MM size. And today, the BB has arrived. Just compare the shape with the BB size and the PM size – they have two different appearances – the PM is rectangle while the BB size is more like squared. Which one do you adore more? Well here’s a tip, if you are planning to purchase a mini bag, go for this one. It’s a sophisticated day-to-evening bag, with adjustable chain to make sure it’s comfortable to carry over the shoulder or on the elbow. It has two interior compartments and it’s quite roomy for a small bag. Fall in love with the leather – the classic Monogram Empreinte Leather will never go out of trend (read more about it here: Louis Vuitton Leather Guide). Embossed with calf leather for durability. And one more thing you should notice is that…while the BB size is smaller, but the clasp is almost as large as the PM and MM size, it feels more luxurious. Measuring 6.7’ x 5.1’ x 2.8’ inches (L x H x W), priced at $1760 USD or €1300 euro via Louis Vuitton boutique. Introducing the Louis Vuitton Monogram Empreinte Mazarine Bag. This newest bag is part of Louis Vuitton Cruise 2016 Collection and was recently released last October. The Mazarine Bag is named after the 17th-century French-Italian cardinal Giulio Raimondo Mazzarino (Jules Raymond Mazarin). It comes in two sizes, MM and PM and comes in three colors, Noir, Taupe and Cherry. The bag features double handles and pleats in front. It has double zip top with a magnetic closure. The interior is made of stripe sari lining and has a flat pocket. It has golden metallic pieces and has four bottom studs for protection. It can be carried in various ways, by hand, on the elbow, and on the shoulder or across the body with the removable strap.